Enclosing a porch for sleeping space is much easier with a sound roof in place. With the roof framing intact, the rest of the construction is similar to any other addition project. One challenge of the room enclosure will be adding heating and cooling, however. Don't assume that your existing heat pump will accommodate the extra floor space. If the porch has a solid concrete base, this can present some additional issues in terms of vents and duct work, too. By thinking through the steps and special challenges, you can design an enclosure that will come together in an organized way. Existing roof space can be extended, if needed, to enclose a new room. Review all roof and foundation needs. Replace a wooden porch base with a concrete slab, for example, in some cases. A small roof that covers a small porch base might need some expansion to create a 10-by-12-foot room, for example. Make sure that the finished room will have an 8-foot ceiling after the interior is finished, too. Take a look at heating and cooling needs and electrical issues. Ask an expert to evaluate how to run duct work from an existing heat pump system into the space. Route it through the home's attic into the porch attic, for instance. Plan to install electric heat in the room or a wall air conditioner for a small space, as other options. Check to find out how electrical wiring for outlets and light fixtures can be brought into the room. Expand porch roof framing, if needed, and add wall framing. Install 2-by-4-inch boards on 16-inch centers to enclose the room. 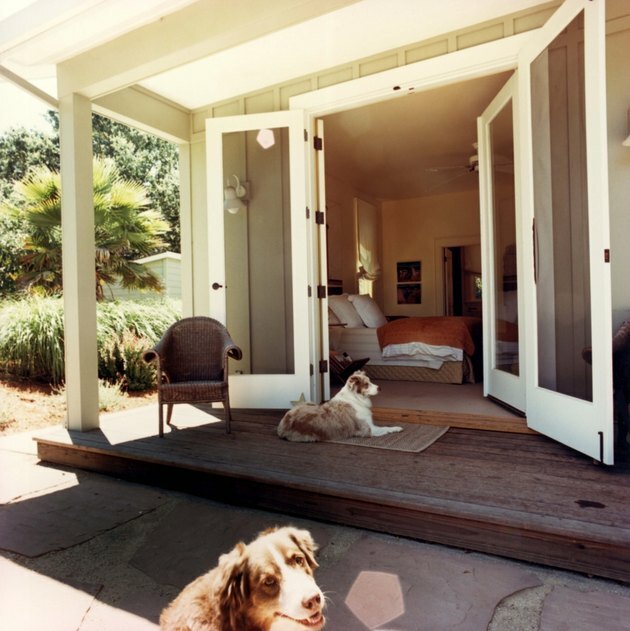 Leave openings for windows and an exterior door or sliding door. Use deeper framing boards, such as 2-by-8-inch boards, if you want to add thicker insulation on exterior walls. Add exterior siding to match the house. Use vinyl siding or brick, for example, so that the enclosed porch looks original to the house. Install siding to match house trim if you can't match up original brick color, or the enclosure will stand out in a negative way. Buy windows that harmonize with windows on the house facade, so the bedroom space blends well. Keep the interior clean and neutral. Add drywall that you will paint pale yellow, for example, and sand-colored tile. Use white trim and white baseboards. Select neutral colors so that the bedroom blends with adjacent rooms. Install furniture that is not overly crowded in the room, just in case the family might use the bedroom exterior door as an exit point.